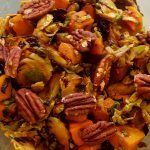 A pumpkin spice lover, not hater–in spite of all the hype–I take my savory and seeet pumpkin seriously. 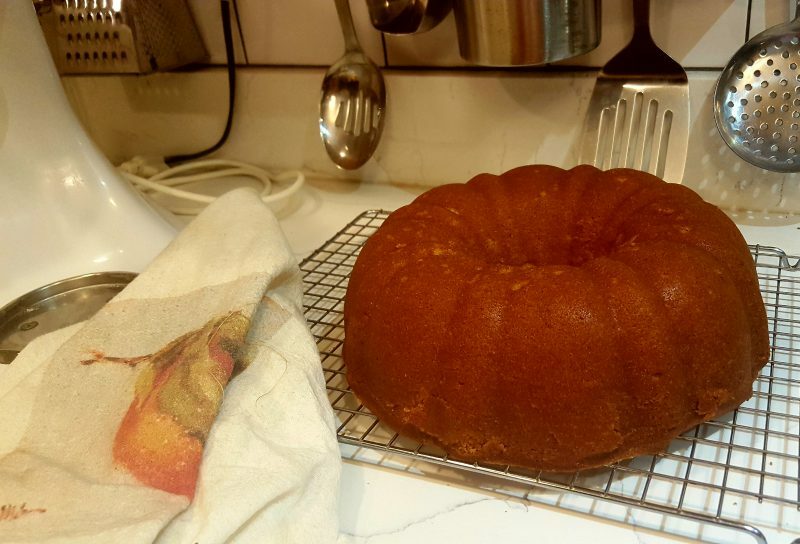 So three attempts and 12 cups of flour later, I finally got it: the perfect Pumpkin Pound Cake in both flavor and luscious moistness and tenderness. The first two cakes were a little dry and we’ll say “sturdy.” The secret to my ultimate success is three-fold: two kinds of fat, both vegan butter for flavor and vegetable oil for moistness; molasses also for deep, flavorful moisture; and the combination of curdled soymilk and vegan sour cream for ever-so-slightly-tangy tenderness (though using all curdled soymilk will work nicely too). Get your pumpkin spice on! In the bowl of a stand mixer, or with a hand mixer, beat the oil, butter, sugar, and molasses for one minute. 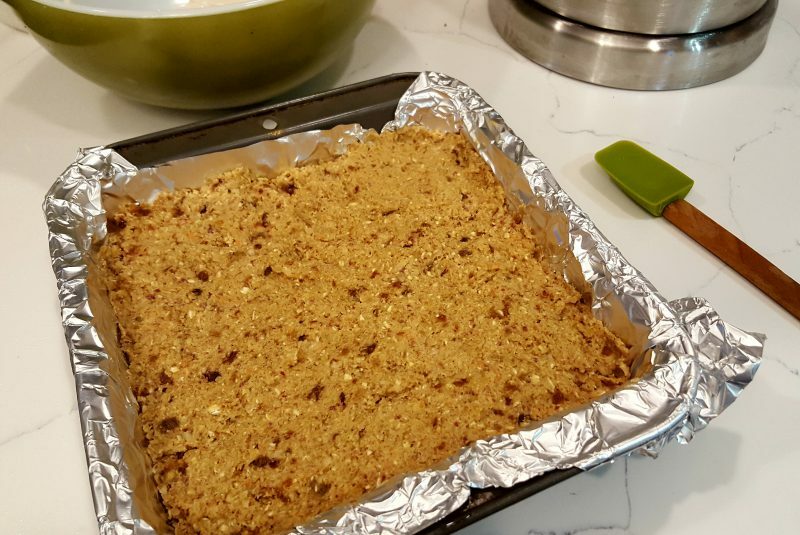 Then add 1/2 cup of the milk, extracts, flax meal, extracts, spices, baking powder and soda, and salt, and continue to beat for another two minutes until the mixture is quite fluffy. Add the flour and remaining nondairy milk to the sugar mixture in three batches, alternating and beating for 20 seconds after each addition. Scrape down the sides and the bottom of the bowl with a spatula frequently. Finally, add the pumpkin puree and sour cream (or 1/2 cup nondairy milk) and mix for 20 seconds. Set on a rack to cool for 30 minutes, then unmold and continue cooling the cake on a rack covered with a dish towel. But, regardless, (practically) raw vegan food has been on my mind lately. I conducted some online research and I bought a couple of (disappointing) cookbooks. My take-away? 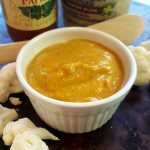 This niche of vegan “cooking” holds great promise, but there is room for fairly vast improvement. So I got to work. 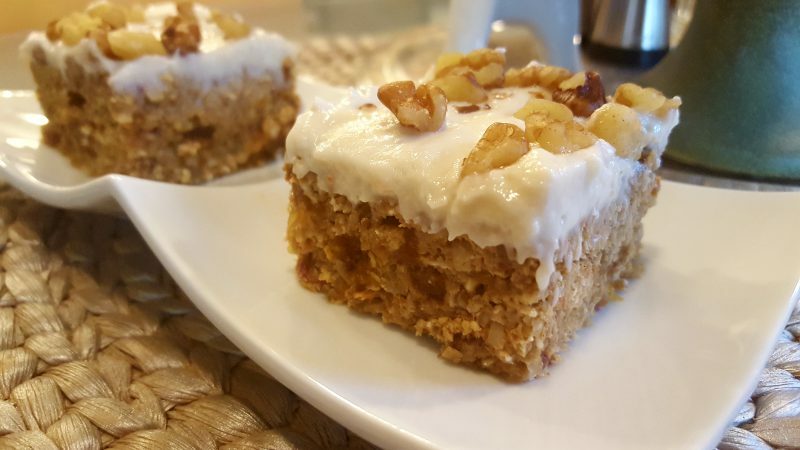 My (Practically) Raw Vegan Carrot Cake was a vegan and omni triumph. 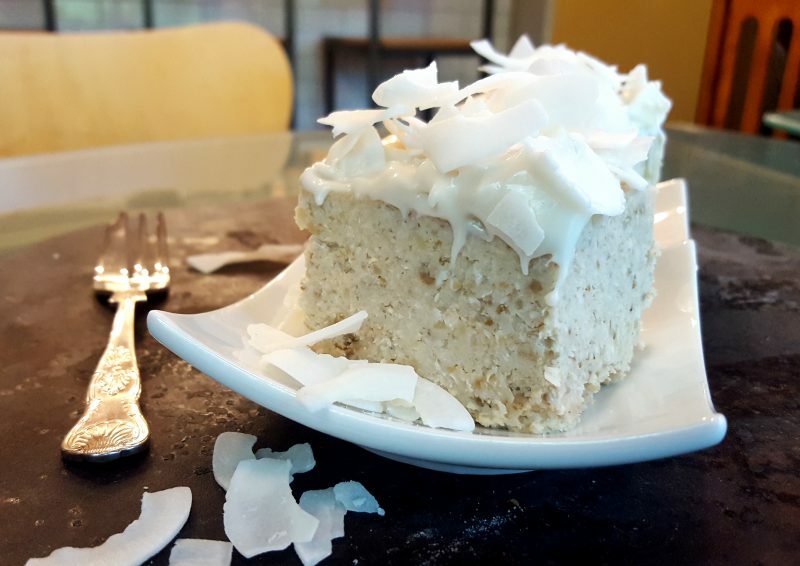 But one of my other favorite cakes is coconut. 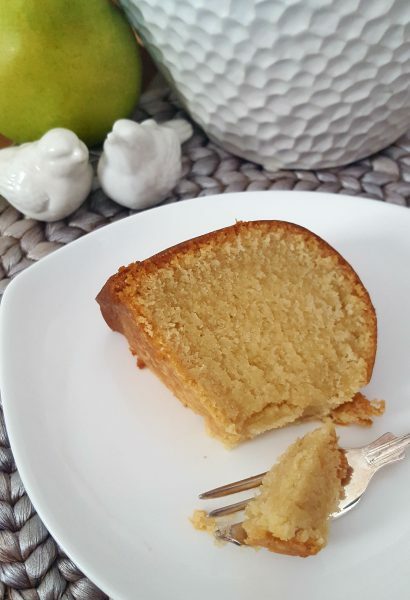 The challenge, it seemed to me, was how to keep the color of the cake light, like a baked coconut cake, and the favor pure: no dates, apricots, etc. At Whole Foods yesterday, I decided to spin through the dried fruit in bulk. Eureka! Turkish dried figs are light in color, yet plump enough to add some moisture and earthy sweetness. Sweetened coconut flakes and coconut flour–essentially coconut ground to a flour–were no-brainers–and I deemed oatmeal, which provides lots of structure, light enough and neutral enough in flavor to help build the “batter.” Blanched slivered almonds (use raw if you prefer)–nicely pale in color and not too buttery in flavor–were the perfect nut to use. One glimpse and I knew coconut sugar was too dark in color, so I bought some powdered sugar which I needed for the frosting, but the cake ended up being sweet enough with nothing more than a small amount of light amber maple syrup. And a liquid sweetener is nice because of the amount of dry ingredients. In short, I do believe I met the challenge. And I think you will be absolutely swept away by the results. Note: if you want a raw vegan frosting, substitute something like a cashew buttercream. Line 8″ square pan with foil. Pulse all ingredients in food processor, a couple of ingredients at a time, alternating with coconut milk, until a homogenized, but textured, dough-like consistency is achieved. Press in pan, frost with cream cheese frosting, and garnish with coconut curls. Cover with foil and keep refrigerated. This, my first foray into (practically) raw vegan desserts, may be the best cake, baked or virtually raw, you have ever eaten. I hope that doesn’t sound boastful, but my omni friend said as she chewed, eyes squeezed shut, “This is like church.” So, it is omni and vegan–and teen and adult- approved. Line 8″ square pan with foil. Pulse all ingredients in food processor, a couple of ingredients at a time, until a homogenized, but textured, dough-like consistency is achieved. Press in pan, frost with cream cheese frosting, and garnish with walnut halves or pieces. Keep refrigerated. 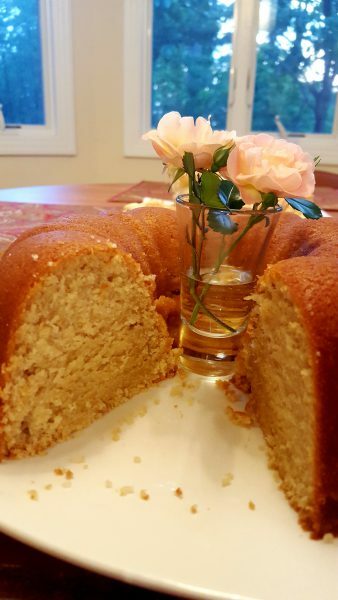 Betsy’s Best Bloomin’ Vegan Cream Cheese Pound Cake…ever! Feeling confident after successfully veganizing my go-to poundcake from years ago (read the backstory and find the recipe here), I decided to try my luck with the Southern Living Cream Cheese Pound Cake that was published in this month’s issue; the one that had me thinking about pound cake to begin with. I am pleased to announce it was another vegan- and meatatarian-approved success. In fact, Bob said he liked it even better than its forebear. Picking for me would be like choosing a favorite dog, so you please be the judge. Both have all the characteristics that I favor: a thick-ish, tender-chewy crust and a density that shouldn’t be confused with heaviness. But, if it is possible that this one is even more moist than the other, it is, courtesy the cream cheese which also lends a pleasing and subtle tang. 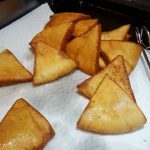 Veganegg is the key to the rise, the structure, and the texture of my pound cakes. But, almond extract is one of the keys to the cakes’ delectable flavor. It masks the savoriness of the Veganegg that comes from the black salt which gives the product its convincing sulphery, eggy taste. Preheat oven to 350 degrees. Grease and flour a-10-inch bundt pan. Place all ingredients in the 4-quart bowl of a heavy-duty electric stand mixer. Beat at low speed for one minte, scraping down sides as necessary. Then beat at medium speed for 2 minutes. Transfer batter to prepared pan, gently smooth top, and bake for 1 hour and 20 to 30 minutes or until a wooden pick inserted near center comes out clean. Cool 10 minutes in pan on wire rack. Then turn out onto rack and cool completely covered with a dish towel. Store tightly covered. 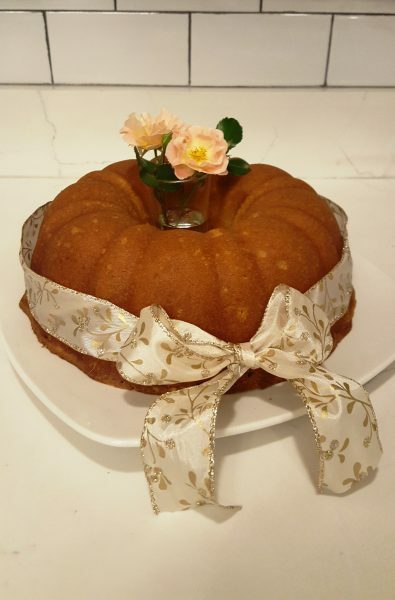 Toss out all other vegan poundcake recipes–including the other one here on The Blooming Platter–as THIS is my best bloomin’ poundcake…ever! My search for the quintessential poundcake began in my youth, well before I became vegan, when I was drug to a “dinner on the grounds” at my grandmother’s country church in rural Mississippi. There, where covered tables set end-to-end stretched over rolling hills under big oak trees for what seemed like as far as the eye could see, I had a religious experience. That is, I tasted pure heaven in the form of a mammouth poundcake such as I had never before tasted. Its crust was a little thick–exactly right–and the tiniest bit chewy in contrast to the almost creamy center, dense but not heavy. It was the Platonic ideal of poundcakes. 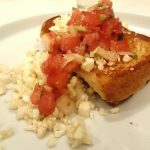 Not knowing who made it or how to procure the recipe, I did what any other determined MS high school student would do in pre-internet days: I called the home economist at the local extension service and picked her brain. I did the same with the home economics teacher at our school, I combed through cookbooks, and I experimented. But the perfection of this poundcake eluded me for oh, say, a couple of decades. Then, in February of 2000, Southern Living Magazine published the Two-Step Pound Cake in their “Taste of the South” column. Ecstatic, I could tell from the photo that THIS was the Holy Grail I had long sought. And I loved that their test kitchen experimentation had rendered the old, time-consuming method of creaming butter and sugar until fluffy, adding eggs one a time until incorporated, and adding the milk and flour in alternating increments obsolete. They advocated placing all room temperature ingredients in the bowl of a heavy duty stand mixer and beating for 3 minutes. And they could not have been more right. The only change I made to substitute buttermilk for whole milk. Eight years later, I became a vegan. 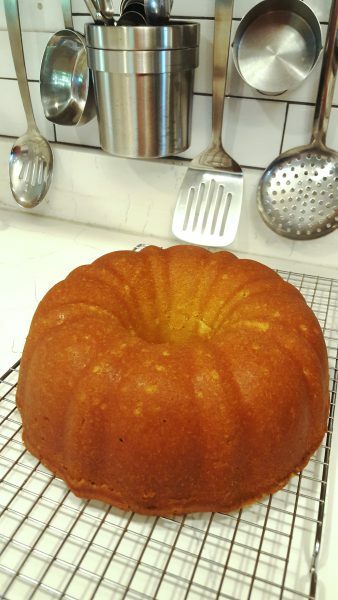 Determined to veganize my go-to poundcake, I failed utterly. The 3/4 cup of buttermilk was no problem thanks to unsweetened soymilk and vinegar. It was those six eggs. No egg replacer did the trick. 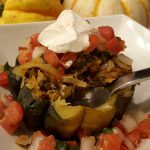 Eventually, I found a recipe online that I tweaked and published here, one that is hugely popular with readers. But it is made in a loaf pan, calls for tofu, and is very close to, but not quite, the chosen one. This past weekend, going to couple friends’ home for a Cuban feast on Sunday evening, I wanted to take them a gift to thank the woman, Barbara, for remaking a quilt of Bob’s that had come unstitched. I knew she wouldn’t take money and, for some reason, I wanted to make a big beautiful poundcake. I think the most recent issue of Southern Living–to which I mostly subscribe for Rick Bragg’s “Southern Journal” column–had planted the seed because they featured yet another “best” poundcake, this one a cream cheese variety. 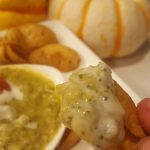 Feeling confident, something told me that a commercial product fairly recently available in our area might be the missing link: Veganegg. I could not have been more right. I made the recipe with just the slightest tweaks and this cake baked up perfectly, rising and not falling; turned out of the pan without so much as a stutter; and cooled into a dome of perfect. Something told me it was going to look perfect on the inside and taste even better so, though I insisted the cake was a gift and that Barbara should not serve it, she insisted that she wanted to try it, and I was secretly glad–and a little relieved–that it looked as beautiful inside as out and it’s texture and flavor were exactly right. It was utterly addicting and comforting in that sitting-under-a-cotton-towel-on-grandmother’s-kitchen-table-with-the-back-door-open-on-a-summer-day kind of way. To make Veganegg, you simply whisk together 2 tablespoons of the powder with 1/4 cup ice water. For six eggs, I used 3/4 cup powdered Vegan Egg and 1 1/2 cups ice water. However, I reduced the buttermilk in my recipe from 3/4 cup to 1/2 cup because, while eggs are almost 1/4 cup of liquid, they aren’t quite, so the Veganegg yields a bit more egg mixture than if I had used eggs. Also, because Veganegg is colored with turmeric and flavored with black salt for that sulphery, eggy flavor that is just right in savory dishes, it is a little strong in sweet ones. So, I added an additional teaspoon of vanilla and a half teaspoon of almond extract to neutralize that flavor. I wouldn’t change a thing. This poundcake is beautiful unadorned, but if you want to guild the lily, as I did for Barbara’s gift, you might consider my simple approach: I purchased a white platter from the thrift store, wrapped the cake in wired ribbon that I tied in a bow, and slipped a thrift store shot glass in the center into which I placed a couple of mini-peach roses from our garden. Pretty enough for the magazine that inspired it. Note: due to the volume and heft of ingredients, a stand mixer with a 4 quart bowl is highly recommended for this cake. Preheat oven to 325 degrees. Oil and flour a 10-inch bundt pan. 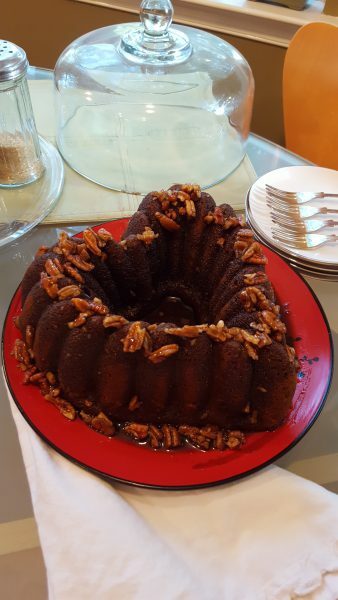 (I use Baker’s Joy with oil and flour combined in a fluted style bundt pan.) Beat ingredients at low speed for 1 minute, scraping down sides of bowl as necessary. Then beat at medium speed for 2 minutes or until smooth and creamy. Avoid over-beating. Transfer into prepared pan and bake for 1 1/2 hours or until a wooden pick inserted near the center comes out clean. Cool cake in pan on a wire rack for 10 minutes, then invert onto rack and cool completely. When cake is mostly cool, cover with a dish cloth. Slide onto a serving platter, decorate as desired, and serve. Cover any leftovers tightly. 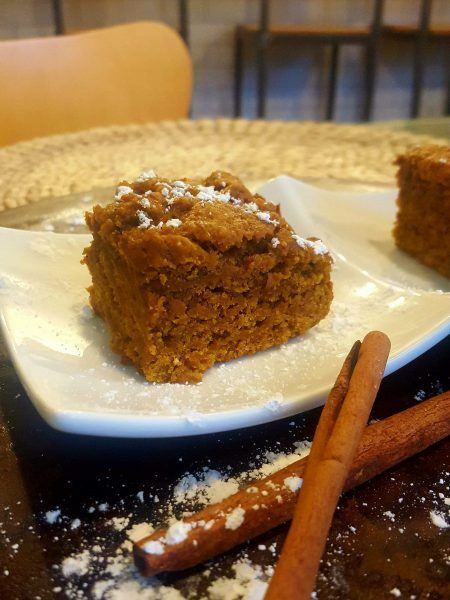 If gingerbread and pumpkin cake got together on a booze-infused evening, this “baby” is what they would conceive. 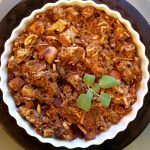 Moist and deeply spiced, it is a carnivore-approved hit with one and all, regardless of dietary preference. 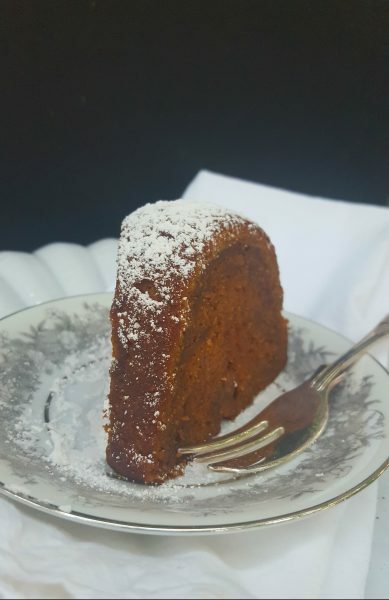 I adapted a favorite spice cake recipe of mine that called for natural cola, substituting pumpkin ale, adding pureed pumpkin, and otherwise tinkering. I enjoy it with a little dollop of Coco Whip as a fluffy contrast to the richness of the cake. Preheat oven to 350 degrees. Grease and flour a bundt pan. In a large bowl, combine all of the dry ingredients, except baking soda, make a well in the center, and add all wet ingredients, except ale. Whisk to completely combine. In a small bowl or cup, whisk soda into ale. It will fizz up. 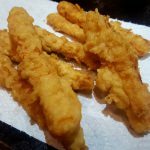 Quickly whisk into batter until completely incorporated. 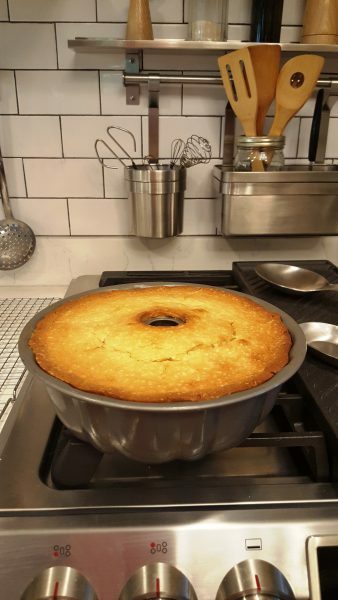 Transfer the batter into prepared bundt pan and bake for approximately 45 minutes or until a wooden pick inserted in the center comes out clean. Remove to a wire rack, and cool for about 15 minutes. Loosen around all edges with a knife, being careful not to slice into the cake. (I use a plastic knife, as my pan has a non-stick surface, but I still grease and flour it!) Place serving plate over the top of the pan and invert the cake onto the plate. Let cool and then glaze if desired. I recommend letting the glaze soak into the cake overnight before serving. In a heavy-bottomed 2 quart saucepan, heat sugar and water over medium-high. Whisk vigorously as it begins to melt. Once the mixture is boiling and amber colored (if you use demerara, it starts out amber colored), whisk in butter until melted. Remove pan from heat, count to three, and slowly whisk in the soy creamer, salt, and optional alcohol. When smooth, allow the caramel to cool for a couple of minutes and then transfer to a small cup or bowl and let cool until a thick pourable consistency. Drizzle or spoon over the cake. 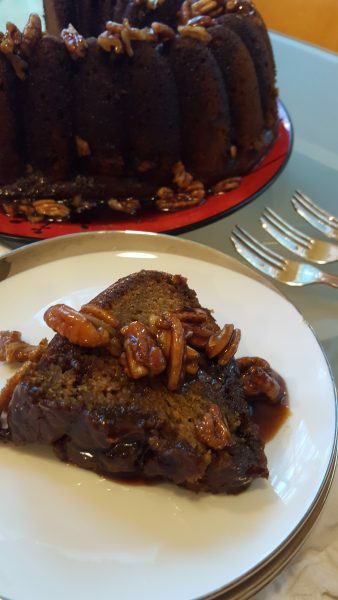 You may either stir the pecans into the mixture before drizzling or sprinkle them over after the cake is glazed. 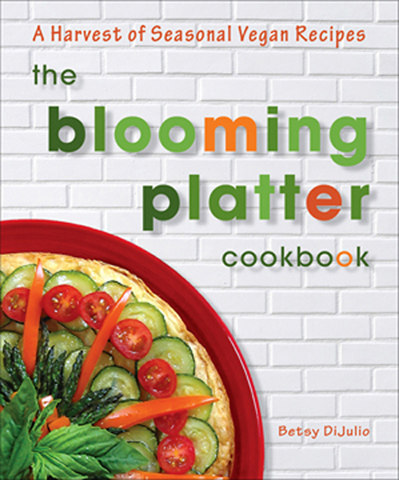 Monday, the day I went live with The Blooming Platter’s fresh new look, would have been my mother’s 83rd birthday. 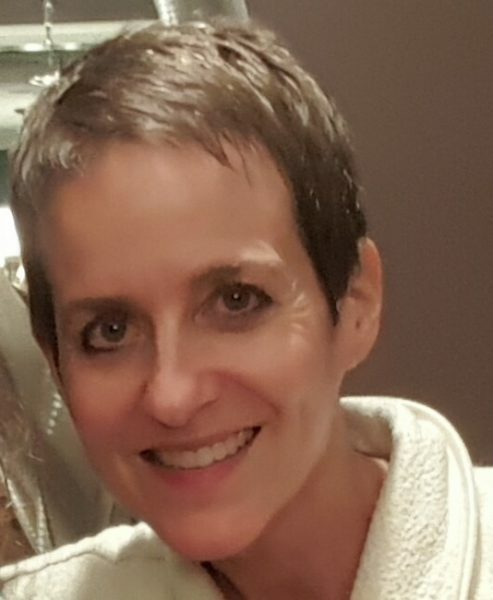 But sadly, she has passed away suddenly and unexpectedly on October 2. My mother and I were different enough to challenge and occasionally frustrate each other, but similar enough in some of our views–you should have heard us get going on theology–and many of our passions to have long been joined by the apron strings even across the miles from Virginia to Mississippi. Even in our shared interests, we often took different approaches. An illustrated essay I wrote entitled, “The Sacred Canon,” was published by Alimentum in June 2015 and paints a picture of my complex mother and some of her culinary dogma in which I took great delight even as it occasionally annoyed me. I’m not sure that my mother had a favorite birthday cake. Besides Creme Caramel, I think her favorite dessert was ice cream–I remember from my childhood that she voted for Baskin Robbins’ “Jamoca Almond Fudge” for family ice cream outings (my sister and I always begged for Dairy Queen)–and she ate a small dish with Hershey’s syrup every night of her life in recent years, sitting with my father in their bedroom, each in his or her blue chair, watching a British mystery, many of which I sent them on DVD. She claimed she had to have “food” to take her evening handful of pills. 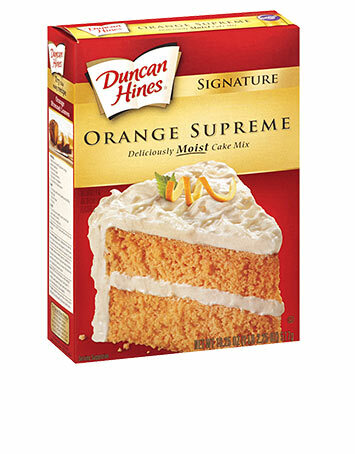 But, I associate her with citrus flavored cakes, possibly because she used to always make an orange cake with lemon frosting for my sister’s March birthday. So, this year, I decided to create mini-memorial cakes. I forwent the lemon frosting, though, for an orange buttercream paired with a luscious Bourbon-Pecan Caramel. I think Mom would approve because, well, she loved her evening cocktail. She was from that generation, you know? The recipe starts with a boxed cake mix because that’s how I got my start baking. In those days, there were no canned frostings, but rather boxed mixes as well, and I recall them as being superior. Still nothing beats homemade frosting which is what I include here along with my simple-as-pie, to mix my metaphors, homemade caramel. Grease and flour a 9-inch metal baking pan. Preheat oven to 350 degrees. In the bowl of an electric mixer, combine all ingredients except caramel, frosting, and garnish. Beat at low speed for 30 seconds or just until combined. Increase speed to medium, and beat for 2 minutes, scraping down sides of bowl as necessary. Transfer batter into prepared pan, gently smoothing top. Bake for 24-27 minutes or until a toothpick inserted in the center comes out clean. Cool in the pan on a wire rack. Using a 2 1/2-inch biscuit or cookie cutter or even a juice glass, cut cake into 16 rounds. Place 1 in the bottom of 8 muffin liners. Top each with about 1 tablespoon of the cooled caramel, remaining rounds of cake, another tablespoon of caramel, and piped on or swirled frosting. 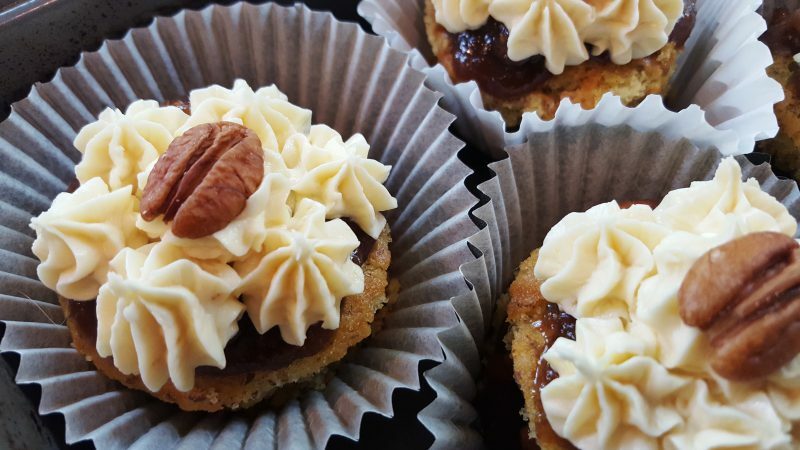 Garnish each mini-cake with a pecan half. 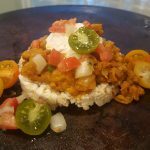 Serve or store in refrigerator until serving time. Remove about 20 to 30 minutes before serving time. Place butter, brown sugar, agave nectar and creamer in a 2 quart saucepan over medium-high heat. Stir until mixture comes to a simmer and then simmer gently, stirring occasionally, for 2 minutes (and no more!). Remove from heat and stir in creamer, bourbon, vanilla, salt, and chopped pecans. Pour into a small bowl, and allow to cool. Cover with plastic wrap gently pressed into the surface. In the bowl of an electric mixer, combine butter and shortening and beat on medium speed until fluffy. Add orange zest followed by 1 cup of confectioner’s sugar at a time, turning off the mixer in between additions, and scraping down sides of bowl. Thin, if desired with creamer and beat to combine. Store any leftovers, covered, in refrigerator. A rolled sponge cake made with eggs is child’s play, as the protein in the eggs add just the right pliable structure necessary to hold it together as it smoothly spirals like wrapping paper around a spool. Not so much with vegan cakes. It took me four attempts to get it right. In the end, it turned out to be both a matter of ingredients and rolling technique (thank you Martha Stewart via my good friend, Sonya Harmon, who witnessed one of my epic fails). In terms of ingredients, I ended up adding a couple of tablespoons of flaxseed meal as an egg substitute. 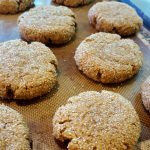 I don’t think you’ll find a single other recipe on this website that calls for flaxseed meal as it simply isn’t necessary or, sometimes, even desirable for most baked good. For this one (an my other rolled cakes), it is critical. And, finally, sprinkling a hand towel with confectioner’s sugar–not granulated sugar as Martha Stewart recommends–turning the cake out onto it, and rolling it up with the soft towel, instead of the crinkly parchment paper used to line the pan, is essential. Lastly, trimming the edges of the cake–so that even the slightest bit of browning doesn’t create a “crust” that refuses to bend nicely–and not unrolling the cake completely flat to fill will yield the most satisfying results. Optional garnishes: shredded toasted coconut,, toasted if desired, chopped nuts, etc. In a small bowl, whisk together soymilk, vinegar, and flaxseed meal and set aside to curdle, making a thickened vegan buttermilk. In a large bowl, whisk together flour, sugar, baking powder, xanthan gum, baking soda, and salt. Make a well in the center and pour in canola oil, vanilla extract, and soymilk mixture. Whisk together for 100 strokes until smooth. (Whisking for a portracted time like this will develop gluten and, hence, structure.) Transfer batter into prepared pan and gently smooth into the corners. Bake for 12 to 13 minutes or just until a wooden pick inserted in the center comes out clean. Allow to cool in pan for 3 minutes and then invert onto prepared tea towel. Carefully peel off parchment paper. With a very sharp knife, trim 1/8 inch of cake from all of the edges. Working from a long side, fold the excess inch or so of towel over the edge of the cake and carefully roll up like a jelly roll. Tuck edges under and allow to cool completely on a wire rack. Carefully unroll, avoiding trying to flatten the cake completely. Gently spread with preserves. Reroll and place seam side down on a serving platter, nestling it onto a flattened side from the previous rolling. 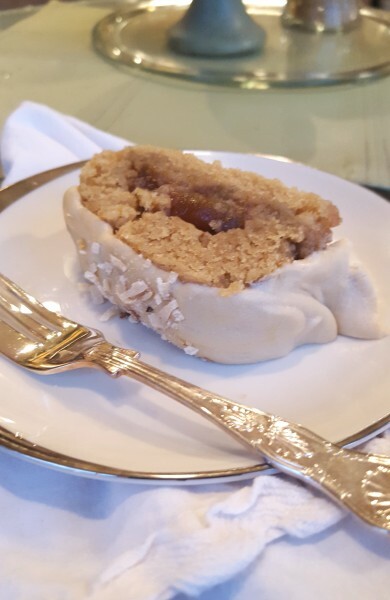 Frost with Caramel Cream Cheese Frosting and garnish with shredded cooconut and/or nuts. Serve immediately or cover, refrigerate, and bring to room temperature before serving. In a small saucepan, melt 1/2 cup butter over medium-high. Stir in dark brown sugar and simmer, stirring, for 2 to 3 minuutes or until a deeper brown with a caramel-y aroma; lower heat if necessary. Remove pan from heat and pour caramel into a bowl. Cool and then chill, covered, for a couple of hours or until cold. Using an electric mixer, beat remaining half cup butter and cream cheese until fluffy. Beat in chilled caramel mixture and vanilla until well combined. Beat in powdered sugar, 1 cup at a time, thinning with non-dairy milk if desired. For a frosting wtih even more body, beat in vegetable shortening, a couple of tablespoons at a time, again until desired texture is achieved.